Finishing school has a special meaning for anyone of us, for Nastja this is definitely an important moment … “What will I do when I grow up”. 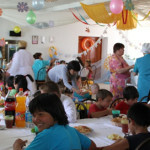 A day organized by Fidelity Fitness Club centers in Almaty, the local partner who has financed the change of the Village theatre into the new gym. On June 1, 2000, with a football match “Ark against the rest of the world”, has been opened the Village of Talgar, a new page in the Ark’s life.